The Philadelphia Academy of Music is the oldest grand opera house in the United States. 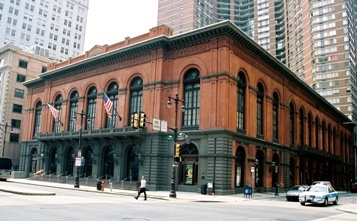 Opened in 1857, the Academy today hosts performances by the Opera Company of Philadelphia, the Pennsylvania Ballet and Philly Pops with Peter Nero. Famous artists who have performed at the Academy include Marian Anderson, Maria Callas, Luciano Pavarotti, Itzhak Perlman, and Igor Stravinsky among others. American Presidents visiting the hall have included Ulysses S. Grant, Grover Cleveland and Richard Nixon. With a main hall capacity of nearly 2900, the hall is constantly in use for concerts, operas, ballets, and other events. The Academy is located at Broad and Locust Streets, just a few blocks south of City Hall.